While Republicans are probably on the verge of voting yet again to repeal the Affordable Care Act, and will continue to make false claims that it has been a failure, Gallup shows once again how successful the law has been. 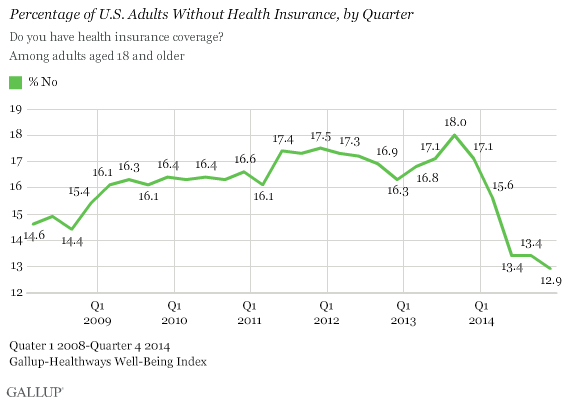 The uninsured rate has fallen to 12.9 percent, down from 17.1 percent a year ago. The open enrollment period for 2015 remains open making it likely that the uninsured will fall further, especially if there is a last minute surge in people enrolling as last year. The number will further increase if more states go ahead and accept the expanded Medicaid program, and more people are also likely to receive insurance from employers with the trend towards decreased unemployment. Gallup also found that most who have obtained insurance plan to continue coverage, either through the same or a different insurance company. Even before the inevitable vote to repeal Obamacare, the new Republican controlled Congress has declared war on math, as Jonathan Chait described it, and have introduced a national ban on abortions after twenty weeks. I recently discussed the pseudo-science used by Republicans to justify this, and there is more at Think Progress.